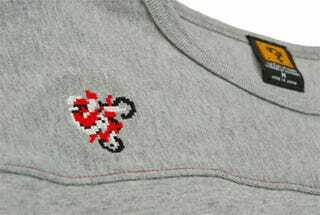 Long-time Kotaku Tower darlings King of Games are hitting 2010 running, announcing a new line of shirts based on classic NES title Excitebike, along with sneak peeks at an upcoming Zelda range. These two Excitebike shirts go on sale this Saturday, one short-sleeved, one a 3/4-sleeved retro football shirt. They're ¥6000 & ¥7140 respectively (USD$66 & USD$80), and as usual, if you want one, you're either going to need a Japanese shipping address or hope the site's English portal stocks them. Then due next month are these two Zelda shirts, which are the right shade of green, but come off looking a little lacklustre compared to the company's previous efforts in the franchise.